DotGuard offers a range of US & ISO standards complaint parts-marking programs fully tailored for brand protection, anti-counterfeiting or vehicle & dealership theft protection programs. Our range of labels and microdot products are absolutely unique, tamper evident, and offer advanced parts-based protection backed by national registration and online database systems. 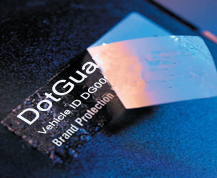 DotGuard offers a range of unique identifier (UID) data matrix, microdot and window etch labels which have been developed in accordance with the new US Government and ISO parts-marking standards. These standards have also now been adopted by the US Automotive Society of Engineers and international governments. Our labels may be fully customized to suit a range of industries and applications. Our labels incorporate both human readable and scanner readable data with up to 2,000 characters of information able to be hidden or embedded in each and every label. DotGuard also offers one of the only label protection systems where labels can be linked using a smartphone directly to either a dealer website or to a police accessible national vehicle database. 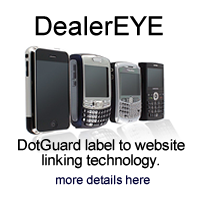 DealerEYE is now available from DotGuard in various label formats. Each and every label manufactured by DotGuard is absolutely unique such that each individual asset or part on a given vehicle may be uniquely identified but still linked to all other labels applied to a given vehicle. 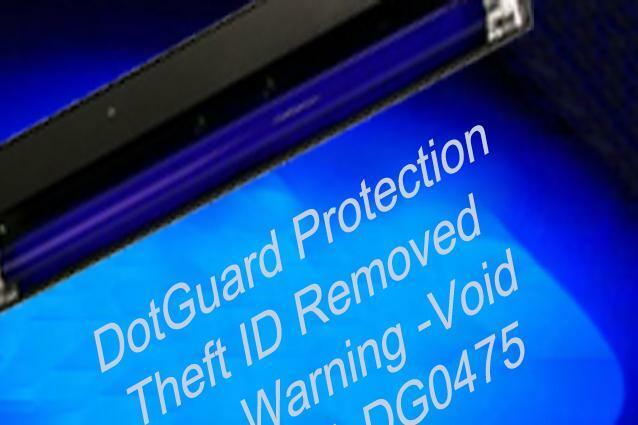 It is this versatility and uniqueness that provides DotGuard labels its advantage over other theft protection programs. DotGuard labels offer high strength and durability with heat resistance to well over 300F. Our labels are designed to be tamper resistant and are available in various substrates and adhesive formulations to suit various industry applications. For example, adhesive remnants, UV marking, and nanotagging are all available. Due to their ease of customization and level of information available on each label, DotGuard labels offer an effective part-marking solutions to many of the theft, asset identification, and parts-trading issues faced by businesses or dealers today. 1) Fully customized parts marking program for your dealership. 2) Able to be sold with your existing theft warranty programs. 3) Fast & easy to apply with no chemicals, acids, or messy adhesives. 4) US standard compliant - complies with mil-std-130 requirements for Department of Defence vehicles. 5) Tamper evident labels or permanent window etching designed especially for use in the car and motorcycle industries. 6) May be used as a theft deterrent for F&I sale or used within service/repair departments as an effective inventory tool. 7) Backed by national registration for the life of the vehicle. Please contact DotGuard for an information pack and pricing. Compare DotGuard labels to other technologies here. Check out our custom designed dealer options here.